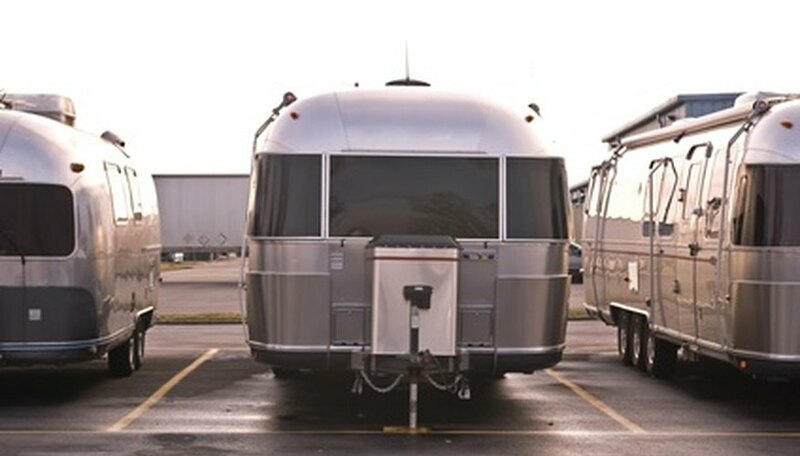 Airstream trailers bring back memories of a bygone era. These trailers were made of aluminum. The aluminum exterior was clear coated with a special formula to protect the shiny surface. This coating must be removed before you can paint an Airstream trailer. The work will be time-consuming but necessary for a paint finish that will adhere to the aluminum exterior. Mix the dish washing soap with water in a bucket. Wash the trailer to remove all dirt and grease. Allow the trailer to dry. Put on the safety goggles and neoprene chemical-resistant gloves. Apply the paint stripper to a small section with a soft-bristled paintbrush. Allow the stripper to dissolve the clear coat for the amount of time recommended on the container. Remove the dissolved paint with the plastic scraper. Wipe the paint off the scraper blade with a rag. Apply the paint stripper to the next small section of the trailer. Allow the stripper to dissolve the clear coat for the amount of time recommended on the container. Remove the dissolved paint with the plastic scraper. Wipe the paint off the scraper blade with a rag. Continue this procedure until the trailer has been completely stripped of all paint. Soak a clean rag with paint thinner. Wipe the trailer down to remove all residue. Wash the trailer again with soap and water. Rinse well with clean water. Allow the trailer to dry for 24 hours. Apply the aluminum oxide primer with a soft bristled paint brush. Allow the primer to dry for a minimum of 24 hours, but no more than 48 hours. Apply a coat of metal aluminum paint with the soft bristled paintbrush. Allow the paint to dry according to the manufacturer's recommended time. Apply a second coat of metal aluminum paint. Allow the paint to dry for 24 hours before use. Buy paint stripper designed to remove paint from metal. Do not skip the primer. The paint will not adhere to aluminum that has not been primed. Never use any cleaning product containing ammonia as it reacts chemically with aluminum. Paint stripper is toxic. Wear your safety goggles and gloves.